The Kobo Aura HD was a departure from the standard six inch e-reader and gave a larger viewing area with the 6.8 inch display. The limited edition model came out in April and quickly gained momentum and customer acceptance. It now accounts for 25% for all hardware sales for the Canadian based company. Today, we compare this unit with the new Amazon Kindle Paperwhite 2, which just came out. The Kobo Aura HD features a 6.8 inch touchscreen with a resolution of 1440×1080 with 265 DPI. This e-reader is seriously the best in the business with its high-definition display. This e-reader also has a built in comfort light, which allows you to read in the dark. In our side by side comparison, you can see that the new Kindle really puts this unit to shame. The Kobo Aura HD is using a 1GHZ CPU processor and has 4 GB of internal memory. This is 2 GB more than what the Glo offers, and you can expand the memory up to 32 GB via the Micro SD card. Battery life is fairly respectable at a solid month of normal use. The Amazon Kindle Paperwhite 2 features a six inch e-Ink display screen with a resolution of 1024×768. The front-lit display has received a small upgrade and gives a better illumination experience then the previous model. Underneath the hood is a 1 GHZ processor and 256 MB of RAM. There is 2 GB of internal storage and the majority of your content will be held in the cloud. 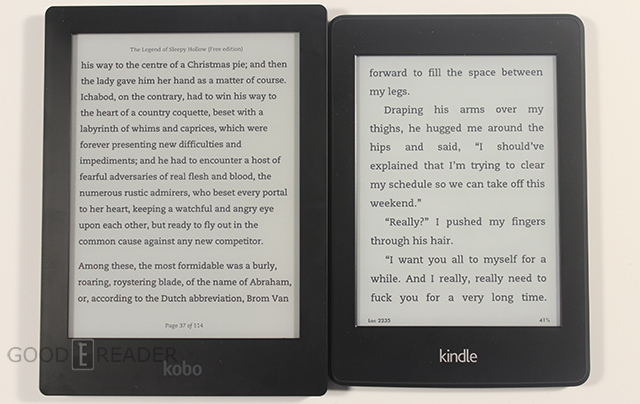 So what are the big differences between these two e-readers? The Aura has more flexibility in your font selection, it has double what Amazon offers. Advanced users may dig the ability to load in your own fonts. The display screen on the Paperwhite gives you a better front-lit experience, but the Aura is higher resolution. One of the cool abilities the Kindle has, is being able to make notes, highlights and annotations in sideloaded PDF’s. Thanks for your always awesome comparisons Michael. I was wondering when are you gonna make one about the Kobo Aura (no HD) vs the NEW Kindle paperwhite. I want to buy one of those but I’m not sure which one. I am specially concerned about the PDF capabilities of both devices. From your other videos I’ve gathered that the pinch and zoom capabilities of the Aura are more polished. However, I like the reflow option that the Kindle has but the Aura seems to lack. Any advice? Regards. Juan. Funny. I did not see the Aura HD being put to “shame” in that video comparing the frontlight. That being said, they both look really good. I’ve had three different ereaders with frontlight ability and they all look better in real life compared to video. Did you pick an X-rated excerpt for your Kindle text in the picture on purpose? Sorry again, but is it a better option to read manga with and how do you use it? Oh my god… that’s hilareous!